L E C T U R E. 18. OF FORSAKING THE FRUITS OF ACTION FOR OBTAINING ETERNAL SALVATION. I WISH much to comprehend the principle of saṁnyāsa and also of Tyāga, each separately. The bards conceive 114 that the word saṁnyāsa implieth the forsaking of all actions which are desirable; and they call Tyāga, the forsaking of the fruits of every action. Certain philosophers have declared that works are as much to be avoided as crimes; whilst others say that deeds of worship, mortifications, and charity should not be forsaken. Hear what is my decree upon the term Tyāga. with a forsaking of their consequences and the prospect of their fruits. The retirement from works, which are appointed to be performed, is improper. The forsaking of them through folly and distraction of mind, ariseth from the influence of the Tama-Guṇa. The forsaking of a work because it is painful, and from the dread of bodily affliction, ariseth from the Raja­ Guṇa; and he who thus leaveth undone what he ought to do, shall not obtain the fruit of forsaking. The work which is performed because it is appointed and esteemed necessary to be done, and with a forsaking of the consequences and the hope of a reward, is, with such a forsaking, declared to be of the Sattva-Guṇa. The man who is possessed of the Sattva-Guṇa is thus a Tyāgi, or one who forfaketh the fruit of action. He is of a sound judgment, and exempt from all doubt; he complaineth not in adversity, nor exulteth in the success of his undertakings. No corporeal being is able totally to refrain from works. He is properly denominated a Tyāgi who is a forsaker of the fruit of action. obtain a final release; not those who withdraw from action, and are denominated Saṁnyāsa. Learn, O Arjuna, that for the accomplishment of every work five agents115 are necessary, as is further declared in the Sāṁkhya and Vedānta-Śāstras attention and supervision, the actor, the implements of various sorts, distinct and manifold contrivances, and lastly the favor of Providence. The work which a man undertaketh, either with his body, his speech, or his mind, whether it be lawful or unlawful, hath these five agents engaged in the performance. He then who after this, because of the imperfection of his judgment, beholdeth no other agent than himself, is an evil-thinker and seethe not at all. He who hath no pride in his disposition, and whose judgment is not affected, although he should destroy a whole world, neither killed nor is he bound thereby 116. That Jñāna, or wisdom, by which one principle alone is seen prevalent in all nature, incorruptible and infinite in all things finite; is of the Sattva-Guṇa. That Jñāna, or wisdom, is of the Raja-Guṇa, by which a man believeth that there are various and manifold principles prevailing in the natural world of created beings. That Jñāna, or wisdom, which is mean, interested in one single object alone as if it were the whole, without any just motive or design, and without principle or profit, is pronounced to be of the Tama-Guṇa. The action which is appointed by divine precept, is perforn1ed free from the thought of its consequences and without passion or despite, by one who hath no regard for the fruit thereof, is of the Sattva-Guṇa. The action which is performed by one who is fond of the gratification of his lusts, or by the proud and selfish and is attended with unremitted pains, is of the Raja­ Guṇa. The action which is undertaken through ignorance and folly, and without any foresight of its fatal and injurious consequences , is pronounced to be of the Tama-Guṇa. and resolution, and is unaffected whether his work succeed or not, is said to be of the Sattva-Guṇa. That agent is pronounced to be of the Raja-Guṇa who is a slave to his passions, who longeth for the fruit of action, who is avaricious, of a cruel disposition, of impure principles, and a slave to joy and grief. The agent who is inattentive, indiscreet, stubborn, dissembling, mischievous, indolent, melancholy, and dilatory, is of the Tama-Guṇa. Hear also what are the threefold divisions of understanding and firmness, according to the influence of the three Guṇas, which are about to be explained to thee distinctly and without reserve. The understanding which can determine what it is to proceed in a business, and what it is to recede; what is necessary and what is unnecessary; what is fear and what is not; what is liberty and what is confinement, is of the Sattva Guṇa. The understanding which doth not conceive justice and injustice; what is proper and what is improper; as they truly are, is of the Raja-Guṇa. to their true intent and meaning, is of the Tama ­Guṇa. That steady firmness, with which a man, by devotion, reftraineth every action of the mind and organs, is of the Sattva-Guṇa. That interested firmness by which a man, from views of profit, persisteth in the duties of his calling, in the gratification of his lusts, and the acquisition of wealth, is declared to be of the Raja-Guṇa. That stubborn firmness, by which a man of low capacity departeth not from sloth, fear, grief, melancholy, and intoxication, is of the Tama-Guṇa. Now hear what is the threefold division of pleasure. That pleasure which a man enjoyeth from his labour, and wherein he findeth the end of his pains; and that which, in the beginning, is as poison, and in the end the as the water of life, is declared to be of the Sattva-Guṇa, and to arise from the consent of the understanding. That pleasure which ariseth from the conjunction of the organs with their objects, which in the beginning is as sweet as the water of life, and in the end as a poison, is of the Raja-Guṇa. tendeth to stupefy the soul, and ariseth from drowsiness, idleness, and intoxication, is pronounced to be of the Tama Guṇa. There is not anything either in heaven or earth, or amongst the hosts of heaven, which is free from the influence of these three Guṇas or qualities, which arise from the first principles of nature. 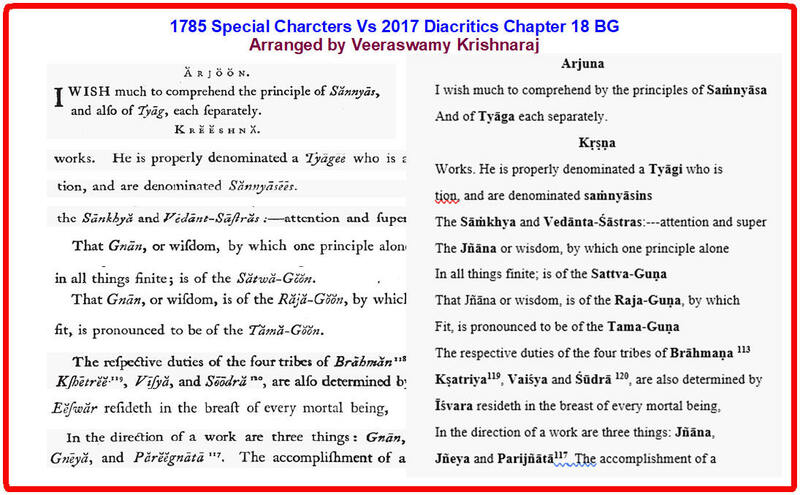 The respective duties of the four tribes, of Brāhmaṇa, Kṣatriya 119, Vaiśya, and Śūdrā120, are also determined by the qualities which arc in their constitutions. The natural duty of the Brahman is peace, self-restraint, zeal, purity, patience, rectitude, wisdom, learning, and theology. The natural duties of the Kṣatriya are bravery, glory, fortitude, rectitude, not to flee from the field, generosity, and princely conduct. The natural duty of the Vaiśya is to cultivate the land, tend the cattle, and buy and sell. A man being contented with his own particular lot and duty obtaineth perfection. Hear how that perfection is to be accomplished. to that being from whom the principles of all being proceed, and by whom the whole universe was spread forth, by that means obtaineth perfection. The duties of a man's own particular calling although not free from faults, is far preferable to the duty of another, let it be ever so well pursued. A man by following the duties which are appointed by his birth, doeth no wrong. A man's own calling, with all its faults, ought not to be forsaken. Every undertaking is involved in its faults, as the fire in its smoke. A disinterested mind and conquered spirit, who, in all things, is free from in-. ordinate desires, obtaineth a perfection unconnected with work by that resignation and retirement which is called Saṁnyāsa; and having attained that perfection, learn from me, in brief, in what manner he obtaineth Brahman, and what is the foundation of wisdom. strength, vain-glory, lust, anger, and avarice; and who is exempt from selfishness, and in all things temperate, is formed for being Brahman. And thus, being as Brahman, his mind is at ease, and he neither longeth nor lamenteth. He is the same in all things, and obtaineth my supreme assistance; and by· my divine aid he knoweth, fundamentally; who I am and what is the extent of my existence; and having thus discovered who I am, he at length is absorbed in my nature. A man also being engaged in every work, if he put his trust in me alone; shall, by my divine pleasure, obtain the eternal and incorruptible mansion of my abode. With thy heart place all thy works on me; prefer me to all things else; depend upon the· use of thy understanding, and think constantly of me; for by doing so thou shalt, by my divine favor, surmount every difficulty which surroundeth thee. But if, through pride, thou wilt not listen unto my words, thou shalt undoubtedly be lost. From a confidence in thy own self-sufficiency thou mayst think that thou wilt not fight. Such is a fallacious determination, for the· principles of thy nature will impel thee. Being confined to action by the duties of thy natural calling, thou wilt involuntarily do that from necessity, which thou wantest, through ignorance, to avoid..
Īśvara resideth in the breast of every mortal being, revolving with his supernatural power all things which are mounted upon the universal wheel of time. Take sanctuary then, upon all occasions, with him alone, O offspring of Bharata; for by his divine pleasure thou shalt obtain supreme happiness and an eternal abode. Thus, have I made known unto thee a knowledge which is a superior mystery. Ponder it well in thy mind, and then act as it seemeth best unto thee. Attend now to these my supreme and most mysterious words, which I will now· for thy good reveal ·unto thee, because thou art dearly beloved of me. Be of my mind, be my servant, offer unto me alone and bow down humbly before me, and thou shalt verily come unto me; for I approve thee, and thou art dear unto me. Forsake every other religion, and fly to me alone. Grieve not then, for I will deliver thee from all thy transgressions. This is never to be revealed by thee to anyone who hath not subjected his body by devotion, who is not my servant, who is not anxious to learn; nor unto him who despiseth me. who doeth me a greater kindness; nor shall there be in all the earth one more dear unto me. He also who shall read these our religious dialogues, by him I may be sought with the devotion of wisdom. This is my resolve. The man too who may only hear it without doubt, and with due faith, may also be saved, and obtain the regions of happiness provided for those whose deeds are virtuous. Hath what I have been speaking, O Arjuna, been heard with thy mind fixed to one point? Is the distraction of thought, which arose from thy ignorance, removed? By thy divine favor, my confusion of mind is lost and I have found understanding. I am now fixed in my principles, and am freed from all doubt; and I will henceforth act according to thy words. favor of Vyāsa, As, O mighty Prince I recollect again and again this holy and wonderful dialogue of Kṛṣṇa and Arjuna, I continue more and more to rejoice; and as I recall to my memory the more than miraculous form of Hari us, my astonishment is great, and I marvel and rejoice again and again ! Wherever Kṛṣṇa the God of devotion may be, wherever Arjuna the mighty bowman may be, there too, without doubt, are fortune, riches, victory, and good conduct. This is my firm belief. THE END OF THE GĪTĀ.